Ships Monday, April 22 if ordered in the next 2 days, 15 hours and 45 minutes! 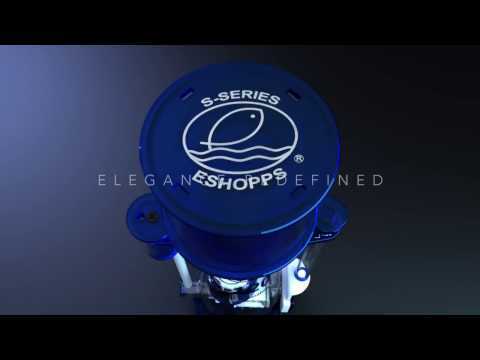 Empowered by a daring mindset, ESHOPPS has pioneered a new standard that will transcend convenience, performance, and elegance in the skimmer industry. Introducing The PREMIER LINE of S-Series Skimmers: a result of game-changing improvements, adaptation of simplicity, and contemporary design. The core of The PREMIER LINE is the ESHOPPS INTELLIGENT DESIGN (EID) Technology and it features 5 advancements specific to our proprietary skimmer designs. At the heart is an innovative bubble plate called EDDY™. The EDDY™ Bubble Plate is a groundbreaking design, incorporating blades that allow for increased contact time with finer bubbles. The EDDY™ Bubble Plate has an easy twist release mechanism for convenience of assembly or disassembly. Additional key EID components include: Twist-Off Base, Quick Release Pump Lock, Transparent Venturi, and a Large Capacity Collection Cup. The new PREMIER LINE of S-Series Skimmers simply packs complex engineering into an elegant design. Less than 3 seconds to twist open the body for easy access. .Much more convenient compared to the traditional body skimmer that utilizes screws to lock the body in place. Traditional skimmer with screws may sometime turn rusty and makes it difficult to turn. Quick release of pump by loosening the screw to slide the pump locks out to remove the pump or to install the pump. See any visible calcium build up and allow for easier maintenance. Holds more skimmate. Don't need to empty it out so often. Water Level: 7" - 9"
Tank Rating: 260 - 500 gal. Yes, this skimmer is submersible. It's standard operating depth is 7-8". Yes, S300 will fit in 200WD. Please note that we usually advise against placing protein skimmer and return pump in the same compartment. You would need to create a divider between the two to prevent micro bubbles from the skimmer ending up in your display tank. 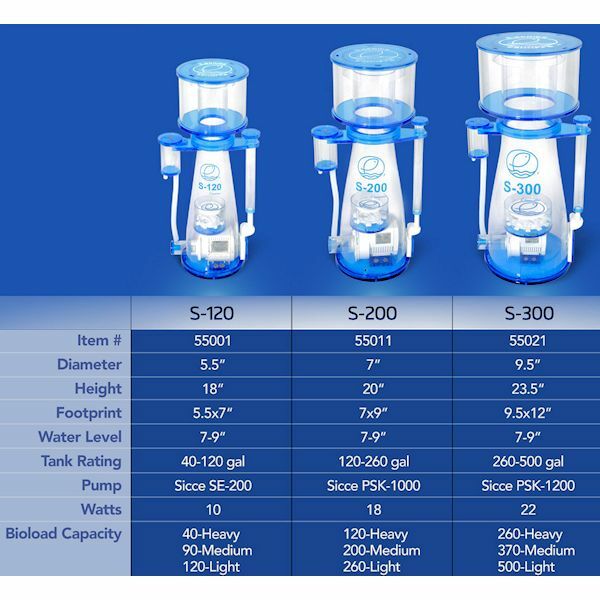 Eshopps Nano Protein Skimmer - 10-35 gal.